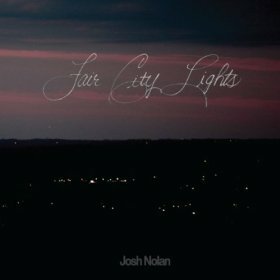 Any mention of Fair City Lights, the debut album from Lexington, Kentucky’s Josh Nolan, will certainly — and fairly — note comparisons to early Springsteen. If not for Nolan’s voice alone, one listen to “‘Til the Words Run Out” with its E Street swing, will illuminate this reference. Yet there are more influences at play on Fair City Lights, from the Stones-ish guitar on “Lulbegrud Revival (Golden Age)” to allusions to acts such as the Eagles, Bob Seger, et al. Opening with the lispy, do-me-wrong country plea “Do It Right,” Fair City Lights lives up to its title, detailing summer memories under “midnight constellations” in the backseats of cars, when love and life are one’s only concern. It is the album’s quieter moments (“Brave Heart, Too”, “East KY Skyline”) that deal more in country than any Jersey sounds associated with Springsteen — and in which Nolan is his most visceral, often howling his lyrics like a man possessed by the passing moon. The Midwest earnestness of Fair City Lights owes more to John (née Cougar) Mellencamp than The Boss. “When I Was Young,” the decades-later postscript to John Cougar’s “Jack and Diane,” resounds the backwards-looking tenor of the album. The sequence of Fair City Lights is just as integral to the album as the songs themselves. Following the rollicking “‘Til the Words Run Out,” the album closes with a somber violin that starts “Between the Lights,” an ode to living in the moment that builds to a machine gun litany of Nolan’s lyrical influences before fading out, having laid it all on the line in jubilant fashion. Having exhausted the strawberry wine and sweated out its impact and then some, Nolan is left with nothing more to give: there could be no more perfect ending to an album from an artist who proudly wears his heart on a rolled-up sleeve. Initially pitched as a crowd-funded album whose campaign went unfulfilled, Nolan’s confidence was strong enough to see the release through on his own. For such perseverance we should be thankful as Nolan has produced perhaps the finest independent album released yet this year — and one I’m happy to deem Vinyl Worthy. Purchase Fair City Lights via iTunes.